The heat has gotten to me and I’m delusional with projects in both houses, summer trips, and a new found addiction to auctions and estate sales. We’ve been in the house in the village for about two months now and we absolutely love it. The location is perfect, the layout is wonderful and I’m deeply invested in its rehab. The current project in the village house is the closet in our bedroom. I took some shiplap from the school house and experimented with repurposing it for baseboard. I really like how it turned out. Here’s the closet progress so far. Realistically we probably won’t get the roof repair and the brick wall repair done before winter. Both of them come with a hefty price tag. The rest of the work is for the most part sweat equity. I’m planning on getting pretty sweaty. The awning rebuild is very close to completion, just a few more pieces of slate, then we have to paint it…so never mind….we’re not done yet! Gramp’s going to go into a bit more detail on this project in the next blog. I sourced the slate for the awning roof but other than that I didn’t have much to do with this one. Gramp is still going with his awning rebuild, thanks everyone for the slate donations! The funny thing about making a paint color decision is that once you make one color choice it kind of dictates all the rest of the color choices. Gramp is super eager to get some exterior paint on. I’ve done a few experiments with color and gotten mixed reviews. The other funny thing is that once you paint one thing you say “that looks so good now I want to paint this and this and that.” The third not so funny thing is that paint is expensive. One fellow DIYer called it liquid gold. I see his point. Next week is one of my favorite weeks of summer the WASHINGTON COUNTY FAIR!!! Yours truly will be manning the Perkins Hollow Schoolhouse on Wednesday and Thursday nights starting at 6pm. Stop by and keep me company! When it’s sunny and warm I get easily distracted by non-schoolhouse related fun. Since moving back two years ago we haven’t had much time to experience what Washington County and the surrounding area has to offer. Our county is making a renewed investment in marketing tourism and recently launched a new website. You can check it out here. We’re trying to hit up as many of these hidden gems as we can this summer. Shushan Covered Bridge Museum and SCHOOL HOUSE!! Can’t Get Enough School House? I’ve been a little spotty with blog updates…again all the sunshine is getting to me. I’m going to shoot for one blog every two weeks. 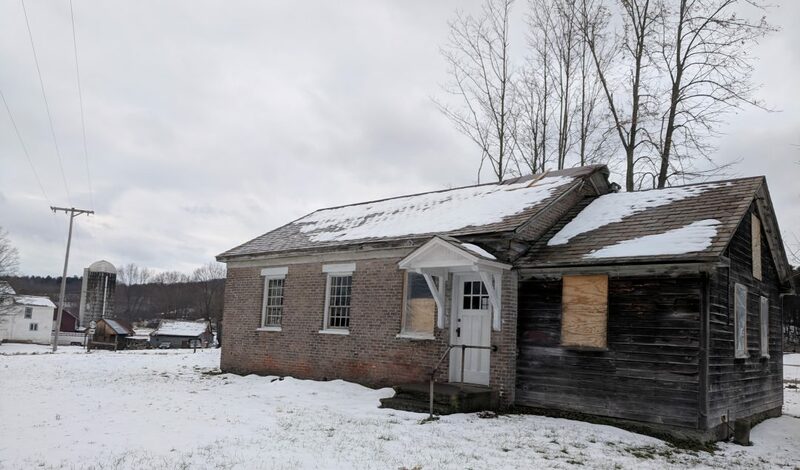 If you need more of a fix check out blogger and fellow school house owner Janelle and her project, the Bass Lake School House. I’m a Perkins and I didn’t realize there was a Perkins Hollow or a schoolhouse. Can you tell me where the Hollow was, is? Any history I can read up on? Will try to get to the schoolhouse at the fair too. Really love listening to all you’re doing with the school and now, your house.